Politics • Organization will plan, host political debates every election cycle. 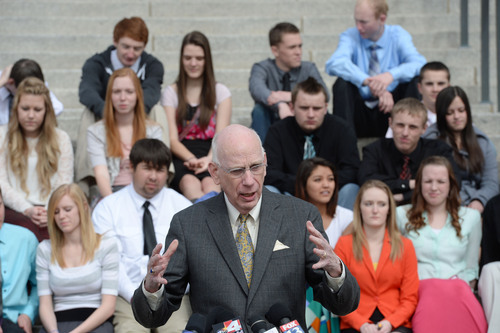 Steve Griffin | The Salt Lake Tribune With students from Canyon View High School in Cedar City behind him former U.S. Sen. Bob Bennett talks during announcement of the formation of the ìUtah Debate Commission,î an independent and bipartisan group that will plan, host, produce, and televise debates among candidates for statewide and federal office. The event was held on the Utah State Capitol Steps in Salt Lake City, Utah Monday, February 24, 2014. Steve Griffin | The Salt Lake Tribune With students from Canyon View High School in Cedar City behind him former U.S. Sen. Bob Bennett talks during announcement of the formation of the "Utah Debate Commission," an independent and bipartisan group that will plan, host, produce, and televise debates among candidates for statewide and federal office. 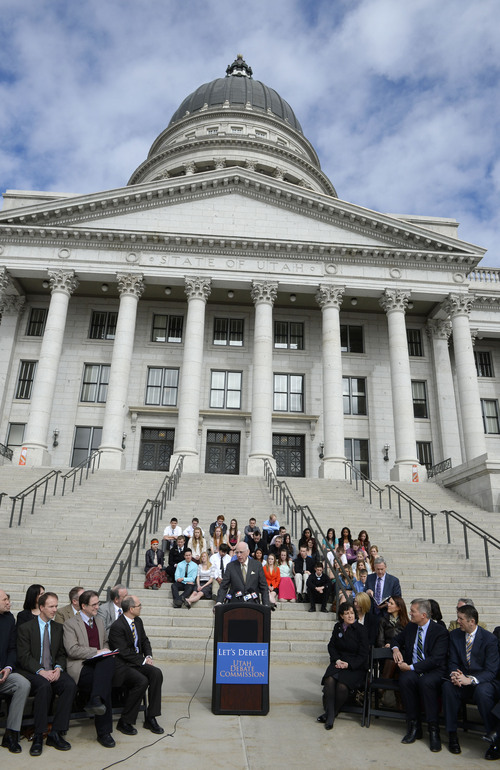 The event was held on the Utah State Capitol Steps in Salt Lake City, Utah Monday, February 24, 2014. Steve Griffin | The Salt Lake Tribune Former Gov. 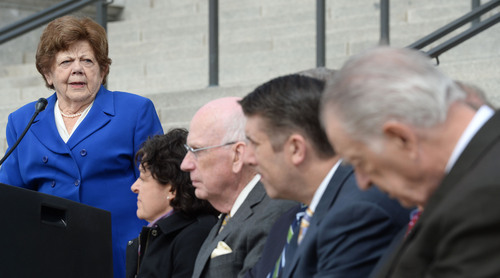 Olene Walker talks during announcement of the formation of the "Utah Debate Commission," an independent and bipartisan group that will plan, host, produce, and televise debates among candidates for statewide and federal office. 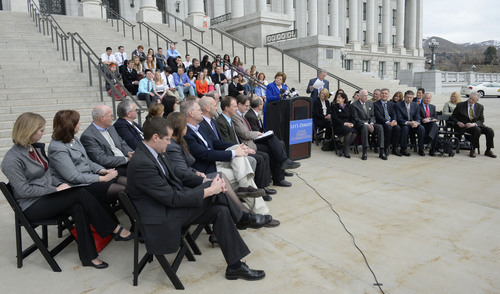 The event was held on the Utah State Capitol Steps in Salt Lake City, Utah Monday, February 24, 2014. Steve Griffin | The Salt Lake Tribune Former Gov. Olene Walker talks during announcement of the formation of the "Utah Debate Commission," an independent and bipartisan group that will plan, host, produce, and televise debates among candidates for statewide and federal office. The event was held on the Utah State Capitol Steps in Salt Lake City, Utah Monday, February 24, 2014. 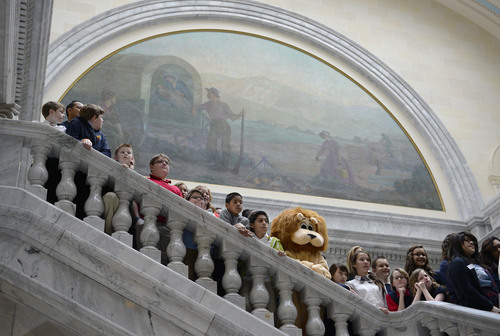 Steve Griffin | The Salt Lake Tribune Students form Utah charter schools line the steps inside the Utah State Capitol as they get their picture taken during the Utah Association of Public Charter Schools day at legislative season at the Utah State Capitol in Salt Lake City, Utah Monday, February 24, 2014. On Monday, they announced the creation of the Utah Debate Commission, a nonpartisan organization that will plan, stage and televise political debates for federal and statewide offices every election cycle. Organizers say the commission will provide an ordered process for debates and give equal opportunities to qualified candidates to get their message to voters. "It&apos;s our hope that candidates, parties and voters will help create a culture of debating in Utah that will enhance the electoral process for all," said former Gov. Olene Walker, a Republican. "We ask voters to encourage candidates to come together with their opponents in a debate setting and allow voters to hear their views on the pressing issues facing our state." As with Count My Vote  a drive to establish direct primaries  the creation of the Utah Debate Commission seeks to engage voters in the democratic process at a time when special interests can dominate elections. "It&apos;s our responsibility to see that candidates that have been ignored get attention in an orderly fashion," said commission co-chairman Bob Bennett, a former Republican U.S. senator. "We want the voters to get to see everyone," said Scott Howell, the other co-chairman and a former Democratic state senator. The commission&apos;s 17-member board boasts representatives of the state&apos;s major universities and news outlets, including Terry Orme, editor and publisher of The Salt Lake Tribune. The newspaper will live-stream debates on its website, http://www.sltrib.com, as well as cover debates in print, he said. Renai Bodley, news director at FOX 13, said her television station and others in Salt Lake City have pledged to cover one-hour political debates at no charge. The commission was born from discussions between educators from six Utah universities, said Richard Davis, professor of political science at Brigham Young University. Organizers determined to do for Utah political races what the Commission on Presidential Debates does every four years for candidates seeking the White House  host debates. "Is the Utah governor&apos;s race less important?" he asked rhetorically. "We don&apos;t think so." Davis announced Monday the debate schedule for this fall&apos;s election. It includes debates for all four congressional seats and the Utah attorney general&apos;s office. James Evans, chairman of the Utah Republican Party, said he remained unclear on the details of the commission&apos;s plans but wanted assurances the debates would be fair and nonpartisan. He pointed to the second presidential debate between President Barack Obama and Mitt Romney and said moderator Candy Crowley was unfair. In that debate, Crowley told Romney that the president had, in fact, labeled the Sept. 11, 2012, attack on the U.S. Embassy in Benghazi, Libya, as an act of terror the day after it occurred. "We&apos;re waiting for firm definitions before we will be on board," he said. Anna Thompson, spokeswoman for the Utah Democratic Party, said she welcomed the debates. "Any opportunity for voters to hear from candidates is a chance for us to show that Utah Democrats are in line with Utah voters."